It’s a fact that when you are comfortable, you drive better. SeatGloves® cover the prime sitting area of the seat and feature a center panel constructed of 3-dimensional fabric with a moisture-wicking surface layer. 3-dimensional spacer fabrics combine as many as three different fibers in a simultaneous knitting operation to create a fabric with moisture management on the surface, spacer fibers in the center for breathability, and stretch solid warp knit fabric in the bottom for additional durability. This is a high-performance warp knit, not a laminate and not a foam, so it won’t flake or dry out. Currently, please expect 4-8 weeks for your order to ship. Moisture Management – Seating panel materials help keep you comfortable. Breathable Cushioning – 3-dimensional center panel provides extra compression resistance, breathability and insulation. Form-Fitting Border – Stretch fabric has the look and feel of neoprene, but it’s also breathable! Fabric panels are positioned in prime seating areas for maximum comfort. 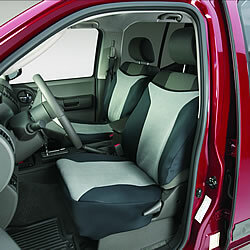 Easy to Install & Remove – Semi-custom sizes for most bucket seats, even with side airbags. Easy Care – Just throw in the washer and dryer to clean. Now available for seats with side airbags!